Blinking LED is the first step you would like to take to get started with electronics. 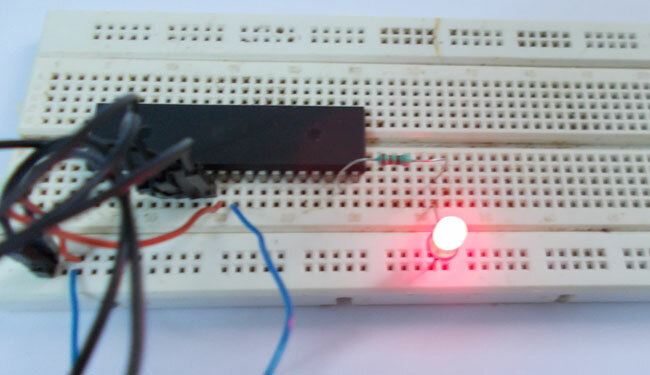 In this tutorial we are going to connect an LED with ATmega32, which is an AVR series microcontroller. We are going to blink the LED at half a second rate. As shown in the above circuit diagram for interfacing LED with AVR microcontroller, there is no need to connect an external crystal here. Because the ATMEGA works on internal 1MHz Resistor-Capacitor oscillator on default. Only when the accuracy of clock is needed, as application of high precision counting, external crystal is attaches. When the controller is first bought, it is fused to work on internal crystal by default. The resistor is connected here to limit the current drawing from the LED. Remember, the controller can not provide more than 30mA at the terminals. The program for ATmega32 microcontroller to blink an LED is shown below. The comments in the code explains the purpose of the individual line of the code. DDRD = 0xFF; // ( or 0b1111 1111) In AVRSTUDIO for telling the controlling to use a certain bit of a port as input we use “ZERO”, for telling it to use a certain bit as output we use “ONE”. Since we put eight “ONE’s”, all the pins of PORTD are enabled as output. If we put a zero as “0b1111 0111”, now all the pins 0,1,2,4,5,6,7 are enabled as inputs and PIN 3 is Enabled as input.